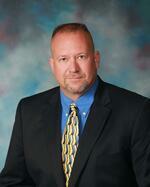 Waukesha, WI – R&R Insurance Services, Inc. welcomes Steve King as Risk Management Consultant. Steve has more than 30 years of experience in the insurance industry, including strategic planning, territorial management, underwriting and risk management. His greatest satisfaction is solving problems for clients. As a member of R&R’s Professional Service Division, Steve will be developing and implementing quantifiable risk service plans, and providing risk management stewardship and client advocacy with carriers. 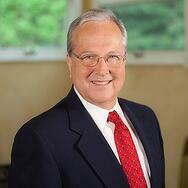 Click to learn more about Steve. 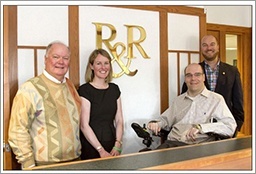 R&R Insurance Services, Inc. has served the insurance needs of southeastern Wisconsin since 1975. Today, R&R is Wisconsin’s largest singly owned independent insurance agency offering businesses and individuals a full range of insurance products including property casualty, employee benefits, workers compensation, liability, life, dental and home/auto. R&R is also a shareholder with Assurex Global, a worldwide network of leading independent insurance agencies. Business Insurance® named R&R Insurance Services, Inc. as one of the Best Places to Work in Insurance for 2015. According to Business Insurance®, the award is based on a two-part assessment of the company. The first portion includes a questionnaire completed by the employer about company policies, practices and demographics. The second portion is a confidential employee survey on engagement and satisfaction. Companies recognized fall into three categories — large employer, medium employer and small employer — in the industry segments of benefits brokers and consultants, claims managers, group life/health insurers, property/casualty insurers, retail agents/brokers, reinsurance brokers, reinsurers and wholesale brokers/managing general agents. At R&R, the employees feel strongly about their workplace, including Human Resources Director Nora Hauser. Business Insurance® is dedicated to honoring employers that have created an environment in which people thrive and enjoy their work. This award proves that R&R has not only served the insurance needs of southeastern Wisconsin, but also the needs of their employees in creating a great workplace. Click here to learn more about the current Career Opportunities at R&R. While the need for warm coats has never been greater, it has also never been easier to meet this vital need in our community. R&R Insurance invites you to join them in an effort to ensure that no child goes without a warm coat this winter. R&R Insurance will be collecting clean, gently used warm coats at each of their office locations. With a mission to collect gently used warm coats for local children, Condella’s Coats for Kids is an easy way for individuals and families to make a difference in the lives of their neighbors by simply passing along coats and jackets that are no longer needed. R&R Insurance invites you to bring your clean, gently used coats and jackets to any of the locations below, Monday – Friday, 8:00am - 4:30pm through October 9th. The process is simple: you drop off your extra coat and R&R takes care of the rest! All donated coats will be given to Fox 6 Condella’s Coats for Kids. For more information about Condella’s Coats for Kids, visit http://fox6now.com/2015/09/13/condellas-coats-for-kids-how-you-can-donate-get-involved-in-the-collection/. Or join our conversation on Facebook and Twitter using #CoatsForKids. 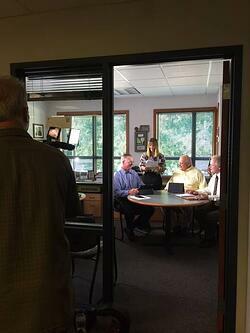 New TV Commercials Coming to a TV Near You! We are incredibly excited to share our new TV commercials with you! 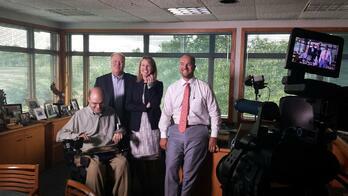 We've been busy filming and hope you recognize some of these smiling faces. 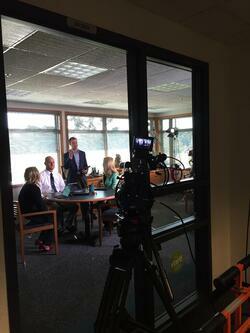 Keep an eye on our social media sites for a preview of the final commercials later this fall! Living a healthy lifestyle is a conversation we often have with our clients. Whether it’s encouraging a family to practice safe driving skills or educating an organization about the benefits of being active, R&R has a passion for wellness. Recently, R&R employees participated in the WELCOA (Wellness Council of America) Top 100 Active Companies Challenge. To participate in the Challenge, companies needed 30% of their employees engaged throughout the 12-week program. Aimed to combat sedentary behavior, the Challenge triggered positive habit changes which made people continuously active throughout their daily life. The results from our challenge were outstanding. We hope some of these examples inspire you to get up and MOVE throughout your day! The Milwaukee Business Journal recently named R&R Insurance Services a winner of their Healthiest Employer Award. "Being healthy and promoting wellness has become part of our daily activity," said Don Levings of R&R. "This is a tremendous accomplishment and we look forward to expanding our wellness program in the future." This year there were 33 winners in small, medium and large categories based on number of employees, and R&R was a proud 1st place winner for medium sized businesses. Winners were selected through the assistance of Milwaukee Business Journal partner Healthiest Employers LLC, of Indianapolis, which required nominees to complete a 75-question survey. The winners were honored at an awards luncheon on Oct. 23 at The Pfister Hotel in Milwaukee and featured in the Milwaukee Business Journal's October issue. R&R Insurance is incredibly proud to announce that Michael Franz was recently named CFO of the Year by the Milwaukee Business Journal. As in years past, the winners were nominated by colleagues and friends based on their wide range of experience, commitment, character and value to their organizations. The Milwaukee Business Journal's group of judges pored over dozens of nominations, narrowing the field to the final 14 winners. All winners will be profiled in the Milwaukee Business Journal’s Oct. 9 print edition and will be honored the same day at an awards luncheon in downtown Milwaukee. When I first applied to become an HR Intern at R&R Insurance, I hoped I would be considered for the position. When I interviewed a few weeks later, the position looked even more promising. As I walked through the office halls to my interview, I immediately felt the cohesive vibe, and was anxious to become a part of this organization. The office aura flowed with productivity and friendliness. As I sat in the lobby prior to my interview, I noticed R&R had many accolades decorating their walls, and I was astounded. I always knew it seemed like a great place to work, but these awards showed that the employees here thought so too. It wasn’t until after I got home from my first day of work that I fully understood why this company had achieved so many awards. R&R employs quality people who care for each other and the company they work for. If employees are happy and devoted to the work they do, then the company will flourish from the inside out, just as R&R has done successfully for many years. On my short drive to the office for my first day, I didn’t feel as nervous as I expected I might, and looking back, I think it was because the members of R&R are so compassionate and welcoming. Although I undoubtedly wandered around looking like a lost puppy, the other people in the office – my new co-workers – wasted no time in coming up to me and introducing themselves. Their smiles made me feel comforted in this new environment. I am extremely grateful for the opportunity to intern at R&R because it provides me with a view into the internal workings of a prosperous and lively company. Since I have only just finished my first year at UW-Madison, I have never been on the inside of a company before. I am so thankful my first experience in the working world has been in a place where I don’t feel like a lowly intern, but instead a valued employee. All of the employees I’ve met so far have included me on the little things, like a discussion at lunch or snacks for a retirement celebration. Each one of these actions demonstrates the inclusiveness that I’m sure every employee feels when they become a part of the R&R family. I have learned so much more than I expected I would, and my time here is not over. I have learned that each employee is a part of the bigger picture and is necessary to guarantee that the company runs smoothly. No job is irrelevant, and each employee is valued. I have learned that working hard doesn’t always mean working quickly, but rather diligently to make sure that the tiny details are correct. Lastly, I have learned that the character of the company is a reflection of the employees working within, and that the entire company needs to have an atmosphere that is simultaneously friendly and productive. The leaders and managers of a company are only as strong as the people they employ. I can confidently say that I have witnessed a cohesive connection between all employees here and I know that R&R will continue on their path to even more success in the future. About the author: Emily is an R&R Insurance intern learning about the insurance industry through HR and Marketing experiences. Waukesha, WI – R&R Insurance Services announced the merger of Snyder Insurance Agency, an independent insurance agency based in Oconomowoc, Wisconsin. The blending of these two well-established agencies in Waukesha County allows for a greater breadth of resources to clients. “We anticipate a seamless transition and are excited to work with a great partner like R&R Insurance. Their reputable business practices and vast resources assure us that our clients are in good hands”, comments John Snyder III, Owner of Snyder Insurance Agency. Snyder’s customers will gain access to R&R services such as seminars, claims management, safety consulting, and risk management expertise. “This is a tremendous opportunity for all involved and we at R&R are lucky to be in this great position. It reinforces our commitment to do business in southeastern Wisconsin”, said Ken Riesch, President and Owner of R&R Insurance. R&R Insurance will be celebrating 40 years of service in southeastern Wisconsin next year and has been named one of the top 100 Property & Casualty agencies nationally by Insurance Journal. Locally owned and operated, R&R is committed to personal service, quick claim response, and the highest level of knowledge and expertise.